Friend #1: sets her coffee down shaking her head in slight disbelief… I can’t believe you’re getting married this year! Aren’t you excited?! ….So I have to ask: I was on your wedding registry website…. and noticed a marriage and money Workshop……. (look of concern and lowering tone) Are you having money problems? Engaged Friend: Actually we’re doing well and but with each of coming in with a house, our own 401k, my business, my student debt…this workshop can be one of the ways we both get on the same page… with our cash flow, balance sheet, retirement goals, and other financial stuff that can be difficult to talk about. Friend #1: I thought Eric had an investment guy, his buddy from college? Engaged Friend: Oh Brian sells insurance. This is a workshop. Not a seminar trying to sell us stuff. Zero sales pitch. Just professionals like financial planners and estate planning attorney’s with credentials giving us their professional opinion. Like a Propinion. Turns to Friend #2: Alicia, you’re married. What do YOU think? Friend #2: Are you kidding me? I would pay twice the amount to avoid a tenth of the arguments we have around money. And you really don’t know, what you don’t know. Plus, a money back guarantee? Shrugs like…..no brainer. Friend #1: Final question… like a whisper… do you have to be engaged or married to go to this Workshop? Engaged Friend: whispers back… Let’s focus on you finding a man! Female Partner: Reading the sheet… “Thank you cards, nodding in approval… adding name to car insurance nodding… then looking perplexed… And joint financial plan? December was a crazy busy month for which I can only be grateful. I only regret not having carved out time to upload any blog content for the month. Shooting stills for several catalogs as well as a few videos which I’ll further elaborate on in their corresponding blog posts occupied all my attention. This however is focusing attention on the several month long time-lapse video I’m working on documenting the construction of South Lake Union’s newest veterinary clinic, Urban Animal, set to open on Feb. 1st. After months of electrical work the sheet rock is finally up and soon to be painted. 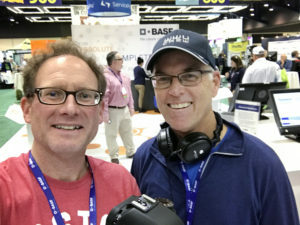 Good times with colleague, John Maynard at the Washington State Convention and Trade Center shooting pest control solutions from manufacturer BASF for Impact XM Marketing & Advertising. We did quite well given a small window to shoot and some other limitations that kept things interesting. Regretfully I’ve been prohibited through a non-disclosure agreement from showcasing this video due to proprietary technology. Difficult for me to understand since everything in the video was on public display during the trade show. Nonetheless, the final product was very well received by the ad agency and the client was very pleased with the work. Just a plug for David Hornbeck at ADH Tech Services. http://www.adhtechservices.com/ David came by the desk today to tune up the central nervous system. Turns out my machine got a clean bill of health. Thanks David! Here’s an brief update on a roughly three month long time-lapse project I’m assembling. 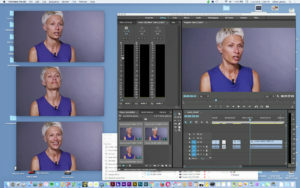 Held to high standards, I recently recorded videos for Jennifer Penney, Seattle/NYC based lifestyle and wedding photographer. She’ll be featuring the work we shot together on the home pages of her two websites, www.jenniferboylephotography.com and www.jenneypenneyphoto.com. My vehicle was loaded with lighting equipment that never got used since her Pioneer Square studio offered plenty of natural light. A 6’x6′ scrim jim helped soften the light a bit. Besides that it was one of those “less is more” days. Jennifer also benefited from my teleprompter. Beamsplitter glass allows the camera to shoot through the transparent back side while the front is completely mirrored to reflect the script scrolling along on my iPad by way of a teleprompter app. 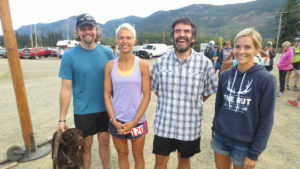 Jessica Mullen, personal trainer, nutritionist & endurance athlete completed the Cascade Crest 100 Mile Race in August (with the aid of her team of coaches). Because there’s no timeline for the completion of this project we’re finally getting around to beginning the editing process. Can’t wait to be able to showcase this awesome video! The clouds thinned out as the day went on during this very busy, very fun shoot for Propet USA. Again, this was a great opportunity to use the wifi feature on my Canon 6D. All images transmitted wirelessly to my iPad. My client could instantly see what I was shooting from anywhere on the set. It was essential in streamlining an ambitious shot list. 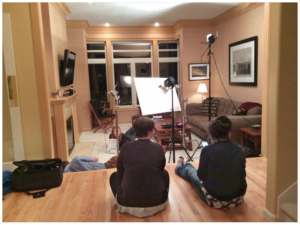 More behind the scenes shots from the several day long project to follow. After a wonderful filming session with Chris Landry, here is one of our video’s. More to come! 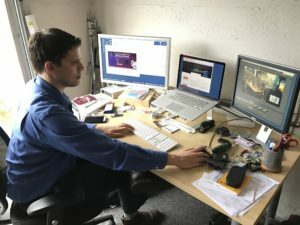 Chris does great work and made the whole process of being on camera VERY easy…Thank you Chris! !